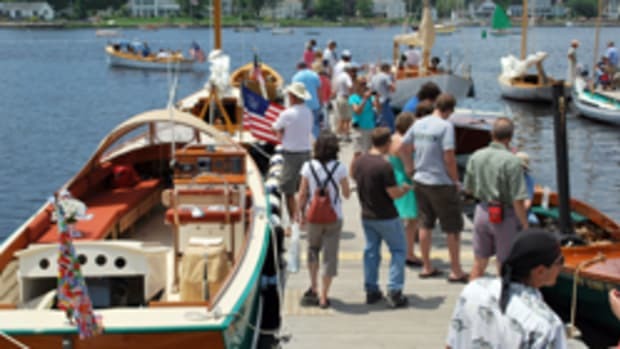 The 19th annual WoodenBoat Show will again be held at Mystic Seaport, running from 9 a.m. to 5 p.m. June 25-27 in Mystic, Conn.
More than 100 traditional and classic wooden boats will be on display, from eight-foot skua race boats to a 100-foot John Alden schooner. Exhibits will include maritime art, antiques, tools, books and nautical gear. The Family BoatBuilding program is also making a return. Ten families from around the country are coming to the show to build their first boat under the instruction of the boat designers. Each year, show organizers honor a member of the marine community who has made a significant contribution, This year Iain Oughtred, a dinghy racer turned boatbuilder and author of "Clinker Plywood Boatbuilding Manual" will be honored with a tribute dinner. Other events will include the return of "I Built it Myself," an exhibit of 50 reader-built boats, Concours d&apos;Elegance, including "People&apos;s Choice," children&apos;s activities, including toy boatbuilding and a performance by The Norway Museum, expert skills demonstrations.